﻿ UN council passes resolution to combat terrorist financing. UN council passes resolution to combat terrorist financing. The U.N. Security Council unanimously adopted a resolution Thursday aimed at strengthening global efforts to combat the numerous and new ways that terrorist groups like al-Qaida and the Islamic State raise funds to finance their operations. The French-drafted resolution orders all countries to ensure that their domestic laws are sufficient to prosecute and penalize those responsible for directly or indirectly financing "terrorist organizations or individual terrorists for any purpose." It also demands that the U.N.'s 193 member states ensure that all measures they take to combat terrorism and its financing comply with international humanitarian, human rights and refugee law — a measure sought by aid, rights and refugee organizations concerned that counter-terrorism laws can restrict their activities. The Security Council has addressed terrorist financing in resolutions since the Sept. 11, 2001 terrorist attacks on the United States, but this is the first to focus solely on the issue and address the new methods extremist groups and their affiliates have adopted to raise money. U.N. counter-terrorism chief Vladimir Voronkov told the council in a video statement from Rome that the resolution's adoption "comes at a critical time." "Recent attacks around the world demonstrate that financial flows continue to reach terrorist groups from both illegal and legal means," he said. "A concerted effort to redouble the world's attention on stopping the financing of terrorism is therefore a vital topic." France's Foreign Minister Jean-Yves Le Drian, who presided over the meeting, said after the vote: "The challenge is very great. Our determination has to be equally great." "We have to tackle the evil at the root and intensify our efforts in order to isolate terrorism by drying up their sources of financing," he said. Le Drian said terrorist groups such as the Islamic State may have been chased from their territory, "but they have learned to inhabit new virtual financial spaces where they exploit new technologies." "They know how to amass funds by opening online pools," he added. "They transform their resources into cryptocurrency in order to acquire drones in cyberspace." 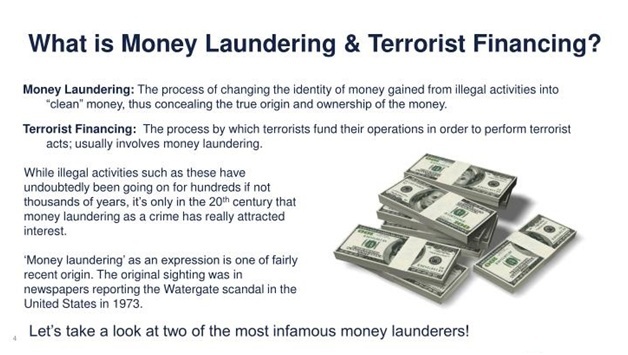 They also pervert informal "hawala" money transfer networks which are especially popular in the Middle East, parts of Africa and the Indian subcontinent, "to transfer funds to the other end of the world" for terrorist activities, Le Drian said. The resolution adopted Thursday strongly urges all countries to implement international standards established by the Financial Action Task Force or FATF, which was established in 1989 by major economic powers to combat money laundering. It has since expanded its work to countering terrorist financing and the financing of nuclear, chemical and biological weapons. Marshall Billingslea, the FATF president, told the Security Council "it is critical for all states to recognize where they may be vulnerable to terrorist financing and then use that understanding to mitigate those risks properly." He said countries must recognize that the risks extend beyond the banking and finance sector to construction, commodities, pharmaceutical trafficking and even the used car trade. Billingslea said groups such as Hezbollah, al-Qaida in the Islamic Maghreb and FARC rebels in Colombia "have all benefited from intermingling funds from criminal and otherwise legal trade for the purpose of funding terror attacks." Kidnapping for ransom is also "a prominent and sometimes even primary source of terrorist revenue," and a major source of funding for the remnants of the Islamic State extremist group around the world, he said, adding that such payments are an incentive for further hostage-taking. Billingslea said more than 190 countries have committed to being evaluated by FATF and implementing its standards. As a result of its assessments, he said, FATF will be encouraging more than 50 countries to pass new legislation to counter terrorist financing. Mercy Buku, an expert from Kenya in combating money laundering and terrorist financing, told the council by video link from Nairobi that there has been a rise in banking over mobile phones, noting that 866 million mobile money accounts — more than 45 percent in sub-Saharan Africa and 32 percent in southern Asia — transacted $1.3 billion last year. But Buku said such money has become attractive to criminals, and she urged governments to adopt regulations to ensure that mobile transactions aren't used for money laundering or financing terrorism. The resolution adopted Thursday urges all countries to establish financial intelligence units, to share information on financing terrorism within countries and to exchange relevant information with other nations.